The overzealous secular media in India is doing a great disservice to Christianity by harping on mythology that Christianity in India is two thousand years old. Even Vatican has not made such a claim because there is absolutely no historical evidence about it. Interesting fiction about Saint Thomas coming to Kerala and his interactions with the Kings and Namboothiris (Kerala Brahmins) are all very good stories to read. Even his escapades in Madras and martyred burial in Thomas Mount make very good bedtime stories for kids but lacks any sort of historical evidence. For those familiar with the terrain and social setup in Kerala in the heydays of Namboothiris, the stories about one Arab national challenging and changing their religion can be termed as nothing but preposterous. 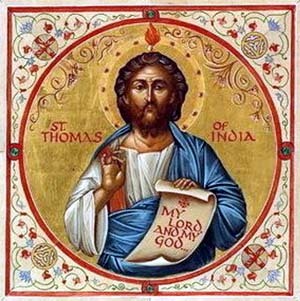 The story about Saint Thomas is nothing but a clever ploy of some Indian Christians to score over their cousins in Europe ' a joke that has become serious. The apex hierarchy of Christianity in Vatican knows this more than anyone else. The simple fact that only very few Indians opted for Christianity in the period preceding the colonial era of Portuguese, Dutch, French and the British, clearly shows lack of appeal of the new religion for the Indians. But the picture changed with the advent of Europeans and much more after India declared itself independent with a secular democratic constitution. Unlike those in the African continent, Indians had their own religions from time immemorial and the new religion of the Europeans never made any appeal to them. Aggressive marketing and coercing could make some impact when the rulers were White. But that too has changed and accelerated efforts are proving counter productive. Vatican has realized that time has come for a more systematic attempt to garner more souls. Hence the new trick of 'saint'ific harvesting. Everything about the organized religion is alien to Indians. We worship Nature and see the element of God in everything. But if someone says that God is someone like us sitting in heaven and he made all of us, and that he is monitoring all our activities for reward and punishment, we can only laugh at them. If they still insist that we must join them in their prayers we will. For Indians who could think of millions of forms of God for ease in worship adding a couple of new forms is not a difficult exercise. But when these fanatic missionaries in their misguided enthusiasm for harvest try to slander other religions and other beliefs which are well above their understanding capabilities, there will be reactions and retributions. Those who complain about such natural reactions have only themselves to blame. They are only harvesting what they are sowing. Increasing failure to attract more and more people by the methods adopted so far has pushed Vatican into the saintific mode now. One helpless Indian nun has already made it and a few more Indian Saints are on their way in the beatification pipeline. The whole exercise is funny and devoid of any logic and conviction. How do we classify someone who has been sick all her life, who did not do any sort of social service nor display any extra-ordinary qualities during her lifetime as a saint fifty years after her death? The argument of divine intervention to work out miracles after one's physical existence got over is nothing but ridiculous to anyone with minimum intelligence. Within a herd of devout followers it is not impossible to produce proof for any miracle. But for outsiders especially rational Indians most of the newly manufactured saints will have only hollow hallows around their heads. The whole exercise would have been appreciated by the truly secular Indians if the intentions are noble. Knowing Vatican with all its stated and hidden objectives the danger that lies ahead for India and Indians is obvious. The whole idea of creating saints out of Indians is to camouflage the harvest with Indian saints as bait. The poor and vulnerable can be easily cornered into the harvest net if there are local signs in the paths leading to the faith trap. In a democratic country with unlimited freedom the possibilities of coercing or luring people to change faith by denigrating their current one or by supplying milk powder and rice are getting very much difficult. The new episode of manufacturing saints is only an innovative idea for continuing with the old conversion game. Millions and millions of dollars have been pumped into India for various methods of religious conversion so far. If the money received so far by the various service organizations are distributed among the poor in India, the country's poverty line would have faded out by now. The evil intentions of the church becomes very evident when we realize the fact that poverty and misery have increased manifold in African continent where the missionaries had a free run for over a century by now. With their simple beliefs and simple needs, the people in that continent led far more happy and contented lives. The same thing happened in Latin America where locals led a far more contented life before another clever ideological ploy of the church namely Liberation Theology wrecked havoc. The liberators have become dictators and poverty has become much more rampant. All said and done, the ultimate objective of the harvesters is crystal clear ' unhindered proselytization and capture power. The mindset of Indians has always been democratic and India shall remain a democratic nation forever. In a democracy it is the number of people that matters. The sole objective of harvesting souls (including the latest version of saintific harvest) is only to get more numbers under the organized banner for the ultimate capture of power. The declared objectives of service to poor and salvation for the individuals are only face saving declarations to hide the real intentions. Once the number is significant enough we can see the next phase of the game in the form of insurgency in Nagaland and Mizoram, and finally sedition as in East Timor. India is very much in focus for intensive religious conversion and the return of White rulers for loot and plunder once again.